UC Davis: J Albala, D Thompson, S Wachsmann-Hogiu, D Matthews. We showed in previous work the development of an antibody-based multiplex assay that correctly identified biomarkers of early and late stage breast cancer from blood serum. To address the need for rapid, point-of-care diagnostics that could enable faster therapeutic decision-making, we are continuing this work by incorporating multiplex protein microarrays into a lateral flow assay (LFA) – consisting of a glass or plastic “chip” that contains multiple linear flow channels – which accepts a clinical sample such as blood, urine or saliva, and performs the necessary chemistry in preparation for a sandwich immunofluorescence assay. The aims of this project are: 1) Develop a rapid novel immunoassay platform for clinical cancer diagnostics; 2) evaluate the feasibility of using minimally invasive tissue samples that are useful for individualized oncology. We have demonstrated proof-of-principle with a benchtop prototype of the LFA chip fluorescence imager (see figure). The LFA chip itself has already been validated against standard laboratory ELISA assays. Because of the inherently small volume within the microfluidic chip, adequate mixing of sample with reagents can be achieved through simple, passive diffusion. 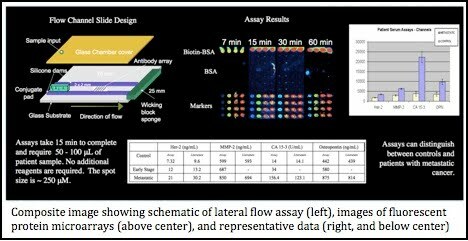 The LFA chip also contains a microarray of protein dots (in this case, antibodies meant to capture specific serum biomarkers) that are subsequently treated with fluorescent antibodies to allow quantitation of each marker present using fluorescence microscopy. After the readout has been performed, the LFA chip can either be discarded or archived for future reference. In an effort to attract clinicians to this technology, we are developing an inexpensive handheld imaging device that performs the same measurement on the LFA chip. The handheld imager built around a CCD camera that uses a battery-powered, single color LED illumination source and provides sufficient field of view to measure 100 (10x10) microarray dots at once. Onboard image analysis is performed using MatLab and ImageJ software. The LFA system was tested with a biomarker protein (HER-2) that is an indicator of breast cancer and was known to be present in blood samples of breast cancer patients. Experiments showed that HER-2 in blood serum samples was easily detected by these devices in clinically relevant concentrations.